This page is divided into the following sections: 1.Club ; 2. County ; 3. University ; 4. Regional ; 5. National ; 6. International (Individual); 7. Matches ; 8. Team Events (Local, National and International). Started composing chess problems in early 1966 and playing for school team in November that year (aged 16). 1967 1st (first tournament); 1968 2nd (to B.Werbickas); 1969 2nd (to B.Werbickas); 1970 1st; 1971 1st. 1989 2nd (to A.Collinson); 1990 4th (to A.Baruch, E.Goodwin, R.Debedoe); 1991 1st, 1992 3rd (to M.Gilbert and A.Baruch); 1993 1st= (with J.Soesan); 1994 4th (to A.Baruch, J.Soesan, T.Blake); 1995 2nd (to A.Baruch); 1996 3rd (to A.Baruch and J.Soesan); 1998 1st= (with A.Baruch); 1999 1st; 2000 1st; 2001 3rd (to A.Baruch, R.Holmes with S.Mellor); 2002 3rd= (to A.Baruch and E.Goodwin, with R.Holmes and A.Moisseenkov); 2003 2nd (to A.Baruch) ; 2004 1st ; 2005 1st ; 2006 5th= (to C.Eckloff and V.Daskevics, M.Page and A.Baruch). CET-Whoberley Chess Club Lightening Ch: 1988 1st; 1992 1st; 1993 1st; 1994 1st; 1995 2nd (to A.Baruch). 2015 3rd = (to J.Pink and D. Ireland with B.Charnley); 2017 3rd (to D.Ireland and E.Goodwin). Durham County Boys Ch (U-18): 1968 1st= (with A.Donkin); 1969 1st. Durham County Ch: 1969 2nd (to E.A.Little); 1970 2nd (to P.E.Walker). Teesside County Schools Ch (lightening): 1968 1st. Teesside County Open Ch (lightening): 1968 3rd (to T.H.Wise, F.N.Stephenson). Teesside County Closed Ch: 1968 4th (to? ); 1969 1st; 1970 2nd= (with T.H.Wise to F.N.Stephenson); 1971 4th (to?). Teesside County Open Ch: 1969 4th (to? ); 1970 1st; 1972 4th (to?). Cheshire and North Wales County Ch: 1976 2nd (to J.T.Farrand); 1977 1st; 1985 (postal) 1st. Warwickshire County Ch (postal): 1993 2nd (to B.J.Briscoe); 1994 2nd (to L.F.Hayden); 2011 1st. Salford University Ch: 1972 1st; 1973 1st; 1974 1st. Salford University Open Ch (lightening): 1973 1st; 1974 1st. Billingham and District Schools Ch: 1968 1st; 1969 1st. Northern Counties Junior Ch (Open): 1967 9th (to L.A.Edwards etc); 1968 4th (to M.Broadhurst etc); 1969 (Closed) 8th (to P.Markland, M.Corden etc.). Northern Counties Individual Ch: 1971 2nd (to J.E.Littlewood); 1978 5th (to D.Adams, D.Everett, J.Horner, J.D.Boyers). Lakes Open Ch: 1970 2nd (to P.W.Hempson). Lakes Open Ch (lightening): 1970 2nd (to K.B.Richardson). British Qualifying (Durham County stage): 1970 2nd (to R.Thomas);1971 1st; 1972 4th (to?). British Qualifying North-East England Zonal: 1971 5th (to B.Eley, M.J.Haygarth, R.C.Lemon, P.N.Lee). Northern Counties Individual Postal Ch: 1981 3rd (to J.J.Carleton, P.R.Markland); 1986 2nd (to L.Bridges); 1987 3rd (to L.Bridges, D.Cowley); 1988 1st. Midland Counties Individual Postal Ch: 1995 3rd (to A.A.Smith, J.A.Hulley); 1996 3rd (to K.McLaughlin, D.Ellison); 1997 2nd (to K.McLaughlin). Coventry and District League Individual Lightening Ch: 1997 2nd (to R.James); 2004 2nd (to P.Davies); 2005 2nd (to C.Green); 2006 7th (to C.Green etc). Coventry and District League Individual Ch: 2004 2nd (to (A.Dawson). British U-21 Ch: 1969 35th (to? );1970 13th (to D.M.Wise, A.Friedlander, S.J.Hutchings etc); 1971 8th (to A.J.Miles, J.Nunn. J.Speelman etc). British Universities Individual Ch: 1972 3rd (to?). British Open Lightening Chess Championship: 1975 12th= (to D.Goodman; J.E.Littlewood and G.Bennet etc). British Chess Problem Solving Ch: 1980 20th (to?). British Correspondence Candidates: 1989 1st= (with A.J.Slinger); 1990 2nd (to A.Corkett); 1998 5th (to A.Milnes, D.Humphrys, F.Eastwood, A.Evans). 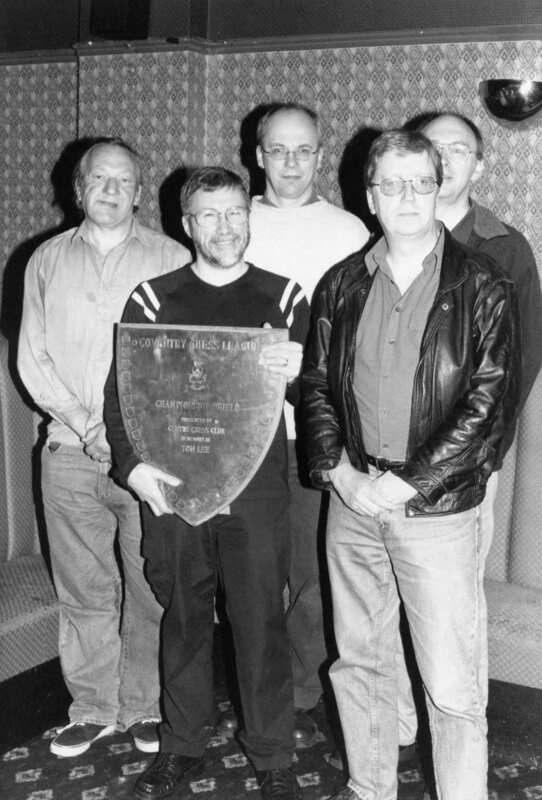 British Correspondence Ch (finals): 1991 6th (to A.Stewart, M.Singleton, M.Johnson, D.Anderton, J.Clark). British Seniors (65+) Ch : 2015 23rd = (to M.Surtees, P. Bielby etc). Thornaby (Teesside) International Chess Tm: 1973 15th= (with British Champion B.Eley to A.Adorjan, L.Alster, C.W.Pritchett, A.Lombard, B.Gasic, V.Raicevic etc). British Chess Problem Society International Tourney for Helpmates in 3 or more moves: (composed with J.Driver and D.Smedley) 1979-80 2nd (to R.List). ICCF European Master Class postal: 1995 4th (to K.Wedervang, K.Metelmann, H.Hess). ICCF Postal Master Norm Tm: 1997-99 6th (to A.Samraoui etc, first title Tm-half point short of IM norm). Russian Correspondence CA 5YR International Invitational: 1998-2001 (15 players including 4 IMs) 4th (to A.Kazoks, A.Rezvyakov, W.Taylor). San Francisco Rated Blitz Tournament: Dec 1998, 4th (to International Master J.Donaldson etc). European Correspondence Championship Semi-Final: 2000-2004 (15 players including 9 IMs) 10th (to A.R.Demetrio, A.Loc etc). BFCC-40 International Invitational: 2002-2005 (15 players including 7 IMs, 3 SIMs, 1 GM) 3rd (to J.Christensen, A.Gmur and on tie break from M.Pichler). IM title score. John Jordan Memorial Postal International Invitational: 2004-2007 (15 players including 5 SIMs, 5 IMs) 7th= (to A.Haugen, F.Velasco etc). BCCA-100 International Invitational (Centenary GM web-server event, category 11): 2006-2007 (15 players including 3 GMs, 9 SIMs and 2 IMs). 7th (to R.Smith, K.Kogler etc on tie break from M.Rinesi) . Second SIM norm and title. Ken Messere Memorial (International Invitational web-server event, category 11) 2007-2009 (15 players including 2 GMs, 6 SIMs, 4 IMs) 4th (to R.Serradimigni, V.Velasco. R.Fenwick). SIM norm score. Slade Milan Memorial (International Invitational web-server event, category 9) 2008-2010 (15 players including 3 GMs, 9 SIMs, 3 IMs) 7th (to Muller and Raykin etc) IM norm score. Russian Correspondence Chess Association-Gold (International Invitational web server event category 11) 2011-2013 (15 players including 1 GM, 10 SIMs, 1 IM) 14th (to Pezzica, Efendiyev and Dolgov etc). Adrian Hollis Memorial (International Invitational web server event equivalent to category 11) 2014-2016 (11 players including 4 GMs, 7 SIMs) 8th (to N.Robson etc). v A.Killey 1968 (played in Billingham, Teesside) won 7:1.
v G.Hochaday 1968 (played in Billingham, Teesside) won 8:2.
v F.N.Stephenson 1970 (played in Middlesbrough) drawn 1:1.
v W.Tchazibane (from Zimbabwe) 1973 (played in Salford) won 3.5:2.5 .
v L.Breivik (from Norway) 1984 (played in Manchester) won 2:1 .
v B.Ufodike 2006 (played in Coventry) drawn at 1.5:1.5 (unfinished with one game left to play). Teesside Schools Jamboree (Team Ch) 1968 1st. Crossley Trophy: 1968 1st=; 1970 1st. Durham County Division A: 1970 1st; 1971 1st. Match versus Scotland 1971 played at Penrith: Won game and match. S.E. Lancs Summer League B 1980 1st. Manchester League Division C 1980 1st. Manchester League Division B 1981 2nd. NCCU Counties Correspondence Ch: 1981 1st. Manchester and District League Div A: 1986 1st. British Universities Team Championship: 1986 1st= . English Counties Correspondence Ch (Ward-Higgs) : 1989 1st; 1991 2nd; 1993 1st; 1994 2nd; 1998 1st; 2004 3rd; 2007 4th; 2011 4th; 2012 3rd; 2013 2nd=; 2015 3rd. Midland Counties Chess Union Correspondence Ch: 1989 1st; 1990 1st; 1991 1st. Midland Club Ch: 1987 1st; 1988 1st; 1990 1st. Coventry and District League Div 1: 1991: 2nd; 1992 2nd; 1993 1st; 1994 1st; 1997 1st; 2001 1st; 2002 1st; 2003 2nd; 2004 1st; 2006 2nd; 2007 1st. Picture (courtesy Graham Goodsir (Meriden Chess Club) of the 2004 Coventry and District League Div. 1 winning team Whoberley A team. Back row (left to right) : Bob Holmes, Andy Baruch, Ed Goodwin. Front row (left to right): myself (holding winner's trophy), Mark Page. Coventry and District League Knock-Out Cup: 1992 1st=; 1993 1st=; 1994 1st=; 1996 1st; 1997 1st=; 2001 1st; 2002 1st; 2005 1st. ; 2006 2nd; 2007 1st. Coventry and District League Divisional Cup: 2006 1st; 2007 1st. Leamington League Div 1: 2015 2nd; 2016 2nd; 2018 3rd. Leamington League Open KO Cup: 2016 1st. Coventry League Team KO Cup: 2016: 2nd; 2018 1st. Coventry League Divisional Cup: 2018 1st. Coventry League Div A: 2018 3rd. Leamington League Div 2 2017: 2nd; 2018 3rd. North Atlantic Team Tournament 1996-2000 (teams of ten players from eleven nations): Represented England on Bd.10-1st place board score. 1st North Sea Team Correspondence Tournament: 1998-2001(11 nations including 2 IMs), Represented England on Bd.6-4th place board score. 7th European Team Championship Final (International Invitational web-server event, category 11) 2008-2010 (15 nations including 2 GMs, 9 SIMs, 2 IMs). Represented England on Bd.2-14th place board score (IM norm score). Olympiad 21 Preliminaries (International Invitational web server event category 4) 2016-2018 (10 nations including 3 SIMs and 2 IMs). Represented England on Bd.4- 5th place board score. (Results of team matches versus USA (three), Finland, Denmark, Australia, Canada, Latvia, Ukraine (Bd.1), France, Cuba and West Germany are under research (so far my personal score in these tallies +10, =10, -1).